The main difference between last summer, when we were mostly (and appropriately) taking deficits in stride, and the current sense of panic is that deficit fear-mongering has become a key part of Republican political strategy, doing double duty: it damages President Obama’s image even as it cripples his policy agenda. And if the hypocrisy is breathtaking — politicians who voted for budget-busting tax cuts posing as apostles of fiscal rectitude, politicians demonizing attempts to rein in Medicare costs one day (death panels! ), then denouncing excessive government spending the next — well, what else is new? have been common knowledge for a long time and haven’t changed a whit in the past year. The other causes of the deficit — Bush-era tax cuts, Bush-era war spending, Bush-era Medicare expansion, and a Bush-era recession — are also common knowledge. And the global recession makes short-term deficits far more defensible than they ever were under Bush. Given all this, the fact that Republicans think deficit mongering is a handy political tool isn’t enough to explain the sea change in media attention. Reporters are all properly cynical about political opportunism, after all. The far more important cause of the change is conservative media. Despite the fact that the operation of the noise machine is hardly a secret, reporters and editors remain curiously obtuse about the effect it has on them. But when the machine goes into overdrive, as it has with the deficit, its memes take on a life of their own. The fact that “regular people” are talking about the deficit is what makes it news, but of course they’re only talking about it because every conservative outlet in the country suddenly contracted deficit fever last year on January 20th. 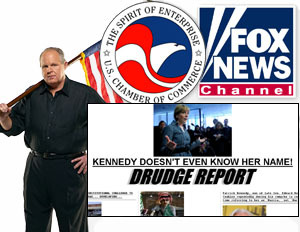 And to appropriate a saying, when the Drudge/Fox/Rush axis catches a fever, the rest of the media catches pneumonia. So more people talk about it. And the media pays even more attention to it. Nice work if you can get it.